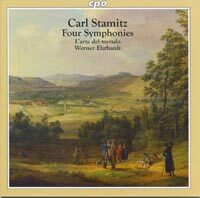 CARL STAMITZ (1745-1801): Symphonies in D Minor, Op. 15/3 (Kai 24), in E Minor, Op. 15/2 (Kai 23), in E Flat, Kai 38 and in F "La chasse", Kai 34. Description: All four of these symphonies date from the mid-1770s and were performed in Paris at the famous Concerts Spirituels. Thus, they should all be in only three movements but the E flat work adds a minuet. There is more than enough memorable melodic beauty, drama (the La Chasse has a hair-raising final rondo) and invention here to let these symphonies stand alongside those of Haydn at the same period. One of the best arguments yet for the stature of this member of the Stamitz family. l'arte del mondo; Werner Ehrhardt.